What better way to use that groupon / voucherwow / online bargain ukulele that you just bought than to serenade to your loved ones? Sure, you have approximately 12 days left. That’s why I’m offering private sessions for beginners to learn the ukulele in one hour! This is a crash course to just play that ONE song that you want to play on Valentine’s Day. Note: This is only for BEGINNERS. For advanced courses or strumming, I recommend you to check out Ukulele Movement, Replugged, Yamaha, Ukulele School or Ukulele Studio. What will you learn in one hour? *Song choice will be advised if the chords to be learned are too difficult for the student and if alternative songs would be easier. No lie, you can learn the same thing by watching youtube, DVDs or from books. The only difference is that I’ll be there to check your technique and give advice when playing. So what are the details for this V-day special? Location and time at the place of the student. I will travel to YOU. Student must have a ukulele. Successful playing of the student’s choice of song in this session varies and will not be guaranteed due to complexity of whatever song they choose. There you go. I’ll be opening up ukulele beginner’s private lessons too but it will be less jammed packed than this V-day special and at a more relaxed pace with more strumming techniques. You can call this the EMERGENCY I NEED TO KNOW HOW TO PLAY THE UKE FAST FOR VDAY TO DO A SURPRISE package. Email me at sarah(at)seriouslysarah.com ! Any chance of me having this crash course for my husband’s birthday? 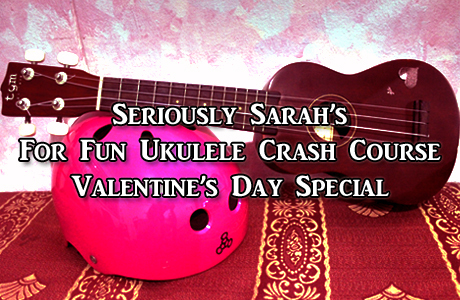 We didn’t have the chance for a valentine’s day this year…I just got a cheap ukulele from groupon. I’d love to play a song for his birthday this April. Please let me know. Thanks for all the advise. I’ll email you today about this.